It’s my belief that every Indian girl has at least one saree in her wardrobe for sure. I had just one saree and few days back I felt urge of buying another (even though there was no occasion to wear one) Nopes I can’t wear to my office at all. I have to travel by metro and I just can’t carry that way. My mother has her few favourite brands and one of them is Triveni Sarees. So I thought why I don’t also buy from Triveni. We were planning to visit some shop when my research mind guided me to search them online. Triveni Ethnics has a strong online presence and my shopping began. Brand – Triveni Ethnics is a brand based in Surat, Gujarat. It came into existence when Mr. Giridhar Sarraf decided to set up Sakambari Silk Mills. Triveni online portal sells all kinds of Indian dresses, accessories for both men and women. They offer numerous designs in all kinds of dress and dress material. My order – I ordered an Amazing Dual Shaded border worked chiffon Saree with code 16010. This is a really pretty, classy saree for an unmarried girl. I really love chiffon sarees that’s why I was drawn to this. The colour, texture of cloth, border design, and blouse style all are so nice. It’s really light weight saree and its majenta-pink colour combination makes it more beautiful. This saree suits my skin tone. The colour combination with border makes it a perfect girly wear saree. 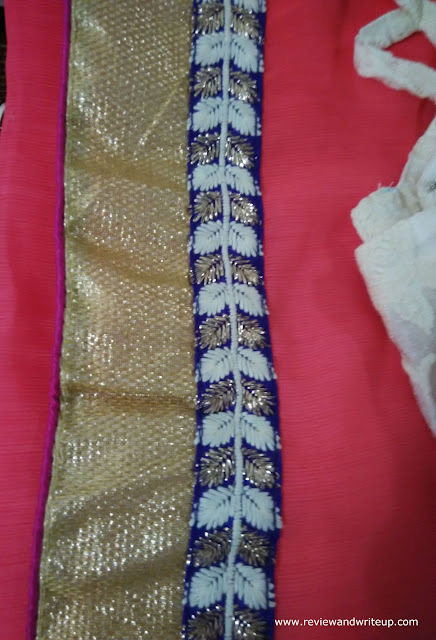 In fact my mom liked it so much that she is planning to wear it by using another blouse. That’s the magic of saree. You can share it with anyone. My experience – The surprise element for me was that the website offers to stitch blouse for you. You just have to send measurements. I did the same and the stitching of blouse was ok as I made some mistakes while taking my measurements. The tailors have done their job well. I loved the saree in pic and in real it looks as it looks like in photo. Triveni won’t misguide you by providing nicer pictures than the product itself. My mom, sister everyone liked the saree. 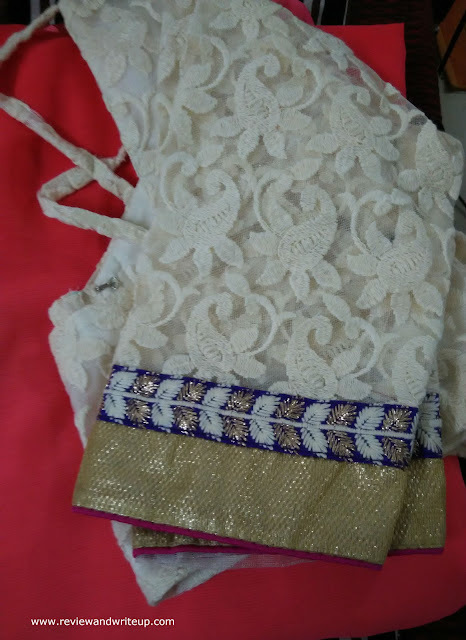 Brand will send you saree pack in nice saree cover which has Triveni Label on it. 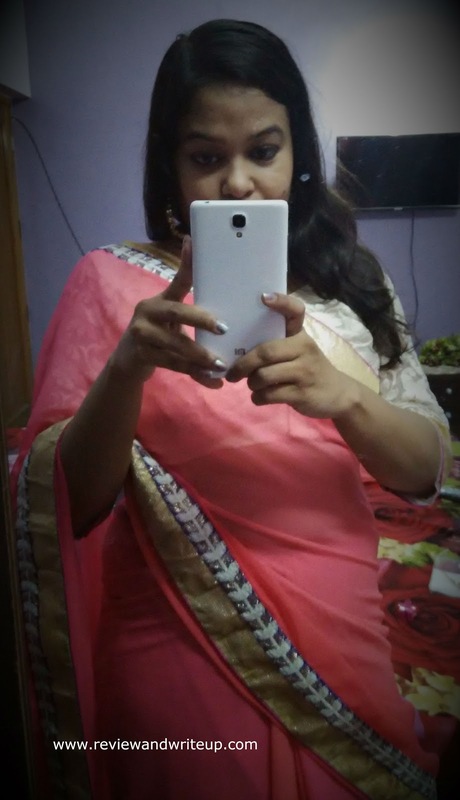 This saree is easy to maintain and I am looking forward to any occasion where I can wear this saree. 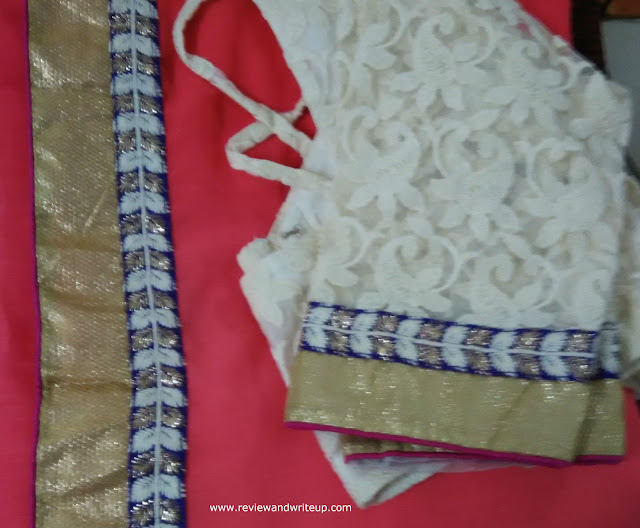 R&W Recommendation – Buy atleast one saree from Triveni for sure. I am sure not only you will love its design but also quality. Beautiful Saree Megha! Its simple and classy.